Enjoy our beautiful small town for the Holiday Season! Feel right at home visiting Dahlonega during Thanksgiving and Christmas. North Georgia Premium Outlets (Dawsonville, GA) is only a short 20-minute drive from Dahlonega and offers great shopping at high-end outlet stores. Each year businesses offer extra discounts to shoppers drawing huge crowds from Atlanta. Save yourself a long drive and get a head start by shopping the night away and sleeping in at Long Mountain Lodge. For a full list of stores, hours and discounts click here. Dahlonega’s Historic Square is always decorated to bring Christmas cheer! Twinkle lights add a magical feel to the beautiful historic downtown. For this annual event, crowds gather around the Historic Courthouse to watch as the square bursts into light. The short video above from Southern Living Magazine highlights what you can’t miss about Dahlonega during the Christmas Season. The Lighting of the Square starts off all of the Old Fashioned Christmas festivities, Dahlonega’s square remains lit until January 13th, 2019. After the rush of Black Friday shopping, shift gears to a simpler time with shopping around the Historic Dahlonega Square. The Annual Small Business Saturday promotes shopping small at local businesses and Dahlonega’s Square is full of great options for shopping and entertainment. Take a horse-drawn carriage ride around the historic square, visit Giggle Monkey Toys for a great interactive toy shopping experience, grab a bite at one of our wonderful restaurants, and for grown-up entertainment try a wine tasting and paint a keepsake at Canvas and Cork. Drop by the Dahlonega-Lumpkin Camber between 11:00 AM & 2:00 PM on the big day for some Shop Small Swag, a Fun Photo Booth and Hot Chocolate! 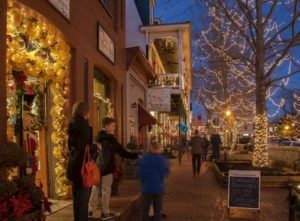 Visit’s with Santa, horse-drawn carriage rides under enchanting lights, dinners at unique and delicious restaurants, what’s not to love about Dahlonega’s Old Fashioned Christmas? Santa Clause will be at the Dahlonega-Lumpkin Camber of Commerce most Saturday’s and Sunday’s to listen to little ones Christmas wish-lists. Additional festivities include caroling and special performances from UNG’s Jazz Band, Live Nativity, and Christmas Parade on December 1st. Most downtown merchants extend their daily hours to 8:00 PM. Click here for a full list of activities and locations.